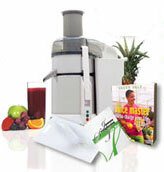 The Juiceman Juicer from Jay Kordich has been making healthy juices from fruits and vegetable for years. Jay Korditch, The Juiceman himself and author of the book Juiceman's Power of Juicing, has been preaching the benefits of natural juicing ever since he overcame a fatal illness through the power of juicing. Unlike the other models of juicer, The Juiceman juice machine stainless steel blade is powerful enough to extract juice from the rind and peel of the live foods you feed into its chute. This unlocks the full nutrient and vitamin value of the fruit and vegetable recipes without the pulp. Jay Kordich advises consuming foods with a high density of nutrients per calorie, and all-natural juicing is the way to get that. Does Juiceman really work? Read this review from user Cherie Calbom: "I was just fed up with all the juice machines I tried until I found The Juiceman...It has a powerful motor. It's never stopped on me. It's been going strong for years now, and it's my favorite juicer. I wouldn't recommend anything else." The Salton Juiceman comes in a variety of models including the Juiceman II Elite, Juiceman Jr (Junior), Juiceman Complete Health Center, and Juiceman Pro. We recommend the Juiceman Pro endorsed on the infomercial by tennis player Martin Navratilova. Juiceman Pro has an extra large chute, 2 speed operation, a titanium-coated stainless steel blade and micromesh screen to fully extract pulp free juice.